We all need a bit of sass and all round coolness in our lives and you don't get much cooler than Nasty Gal's Sophia Amoruso. In the words of Ms Amoruso herself "it's cool to be kind. It's cool to be weird. It's cool to be honest and to be secure with yourself." So coolness aside, creating a $100 million business in 8 years, I was more than happy to read what she had to say! "A #GIRLBOSS knows she may not nail it on the first try, and that's okay. Remember to be open and keep your head up when something doesn't work out." When I was growing up I lived for Saturdays, sitting all afternoon in the library reading books it was my happy place. 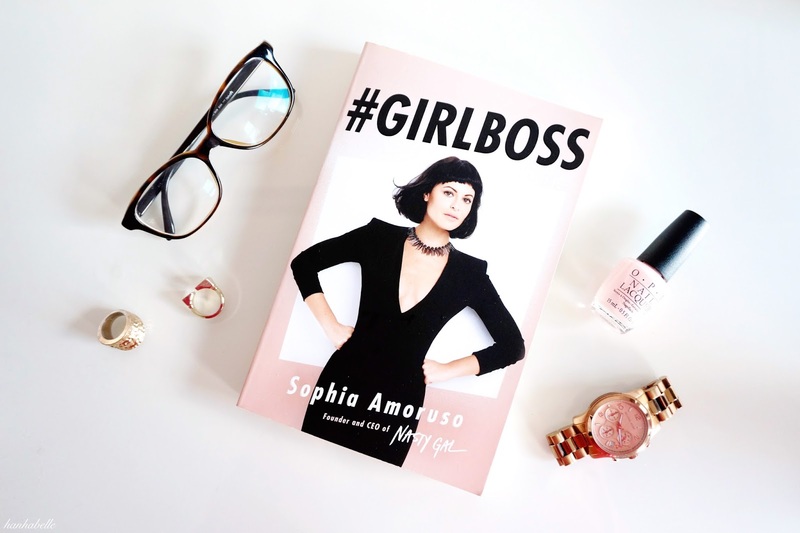 I still get excited flicking through a new book and reading #GIRLBOSS was no different. I was smiling and chuckling to myself at Sophia's humour, her refusal to take no for an answer and nodding along to her no nonsense advice. Her life was not your typical Cinderella success story, she built her business from doing what she really loved. Through hard work not pot luck. She gives realistic advice about looking after your income and not wasting your money, even if you have millions in the bank. It's about being caution but knowing when to take risks. about what you know, but humble with what you don't"
She's been on the hiring and firing ends of job, she's done it all and happy to give back. Offering tips on writing your cover letter, how to ask for a pay rise as well as dealing with investors (dream big guys!) What I love about this book is the living proof of succeeding on your terms, creating something from hard work and passion and never stop learning and growing. She believes in her brand, her team, her buyers, the person reading her book - no one is beneath her. Sophia you rock! #GIRLBOSS to me is not being afraid of hard work, not giving up at the first hurdle, being smart and savvy and all the while knowing your worth. I really feel inspired now! What does #GIRLBOSS mean to you? Worth a read: How to have the best relationship with yourself. I don't have any inspirational books, but I've been eyeing that one for a while. These quotes you've shared made me want it even more. It really sounds like a must-read book to me! This actually sounds amazing. I had seen this book pop up on every second person's wishlists. But I had never before really given it a chance. I'm glad I picked it up, it's a great book to read that's not too in depth and over whelming! Yes I was so pleased I enjoyed it, I figured everyone must love it for a reason?! Plus it was less than £8, so not too bad! I know, I thought I was the only one who hasn't read it! It's a nice easy read too. It's a great book to make you feel like you can achieve anything, super inspiring! I do love this book and its meaning. Its defiantly a good motivator for work! I love a good GIRLBOSS. Any girl making waves is good for women! Wow love your pics hun! I've been seeing this book all over the place but never really thought about reading it! I just might order it now, love how it empowers women to take control of their business! I haven't read it and to be honest, I don't think it's 'my' kind of book anyway. I do like what you're describing here though. I know it's not for everyone, I was after a book to help me start my own business and this really help me get in the empowering mindset. I've seen mixed reviews about it, to be honest. I might give it a try and see for myself at some point! I know some books are not to everyone's taste but I like the business no 'fluff' approach, this book has! I have not read it yet, but have recently finished "Not that Kind of Girl" which was so inspiring, funny, and well written! #Girlboss is one of my must-read books for anyone. It is inspiring and motivating. I'm glad you enjoyed it! Hehe, hopefully you'll love it too! I agree Sarah, such a motivating and inspiring read! This is awesome! I ha no idea this book existed but I am seriously interested now. I have so much respect for women that know what they want and are strong and confident in getting it, it makes such a nice change from what I typically experience everyday when I meet people.